Bunions are a painful foot deformity that may require surgery. Unfortunately, the first surgery doesn’t always fix the problem. If you’re frustrated by recurring foot problems, it may be time to consider reconstructive foot surgery , commonly called revision surgery. Visit a knowledgeable and skillful podiatrist in Sugar Land to discuss whether reconstructive foot surgery might be right for you. There are several surgical techniques that may be appropriate, depending on your specific situation. It’s possible for a bunion to come back after the original corrective surgery. This may occur if the first foot surgeon failed to fully grasp the severity of the deformity or used an inappropriate surgical approach. People with particularly flexible feet may be more likely to have a recurrence. When this situation arises, the podiatrist performing the revision surgery might do a Lapidus procedure. The Lapidus approach involves the fusion of the first tarsal-metatarsal (TMT) joint . After realigning the bones, the surgeon fuses the joint to prevent the first metatarsal from moving too much. The Lapidus procedure should prevent the bunion from recurring again. Sometimes, the first foot surgeon might have overcorrected the bunion, such as by tightening the ligaments too much, removing the sesamoid bone, or removing too much of the other bone mass. To address the overcorrection, the reconstructive foot surgeon might make revision bone cuts or fuse the big toe joint in place. When a foot surgeon must remove some of the bone in order to realign it, the toe becomes shorter. The same effect occurs when the TMT joint is fused. Although some shortening is to be expected, too much shortening can cause problems with the foot’s functioning. Foot pain may also develop. If this is the case, the revision surgery may involve making bone cuts to lengthen the toe. Sometimes, it’s necessary to add bone graft material to rebuild the bone mass. Occasionally, bunion patients might develop arthritis in the toe after having the original surgery. Arthritic symptoms might be caused by improper positioning, bone spurs, or infection. Reconstructive foot surgery may be appropriate to remove bone spurs, fuse the joint, or realign the bones. Plantar warts are benign growths on the feet caused by infection with human papillomavirus, also called HPV. 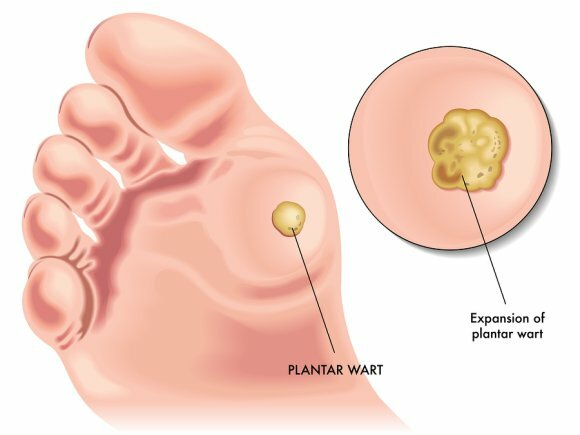 Although harmless, plantar warts can be extremely contagious. They may be passed from person to person, as well as transmitted indirectly via handling or touching common surfaces. Plantar warts are common among young children, who may touch playground or school items that have been handled by a child with an HPV infection. Swimmers are also at higher risk for HPV infection and the formation of plantar warts because they may pick up the virus from showers or pool decks if protective footwear is not worn. Plantar warts will disappear on their own; however, you should take care not to walk barefoot to avoid spreading the virus to others. If you are concerned about plantar warts or have questions about other aspects of your foot health, contact your podiatrist to schedule an appointment. Advanced Foot & Ankle Specialists of Sugar Land offer treatment for plantar warts , athlete’s foot, foot and ankle injuries, and more. Contact us by calling (281) 242-3338 to discuss your needs with an experienced podiatrist. You can find more information about foot health on our blog.